With the camel coat trend taking over, i thought it would be nice to hit the refresh button and remember their are other options out there. I myself am guilty of sticking to the camel coat trend. But I would love a pink jacket! The simplest colour of them all. Black. Victorias blog always reminds me to reuse my basics and go back to the start. Here she has gone for an all black look but has mixed different fabrics – leather, wool and suede. Always a good idea when your wearing all black. Purple is not for everyone. I doubt its even for me if Im honest. But its another alternative to the camel coat. Viva Luxury goes all out with this not only purple coat, but a sparkly one at that. Sincerely Jules always gets colours and warm tones spot on. I think it helps that she has that tanned glowing skin. Greys and whites can be suited perfectly along with nudes. A grey coat is something I think I need. Is a denim jacket still classed as a 90s piece. I mean they have made a huge comeback in the last few years. Honestly Im ashamed to say I don’t own a denim jacket, but I do own a white one. My denim jacket used to come everywhere with me when I was younger (until I left it on a bus) but it was my favourite fashion item. I most wanted a leopard jacket last Winter. The kind that is wool, heavy and thick. A leopard jacket is great for all black outfits or monochrome looks. I don’t know who made up the rule ‘never wear navy with black’ because who ever did you sure have a lot of pie on your face now. I really love this look. And I wouldn’t normally go for a navy jacket because of the rule no black and navy because black is such a prime colour in my wardrobe. But that rule no longer exists. The wool coat has a lot more to it than the trench. I like that this is not a straight bottom and it has the different layers to it. You no Grey will never go out of fashion either so its a statement piece thats for sure. Save the best for right, right? 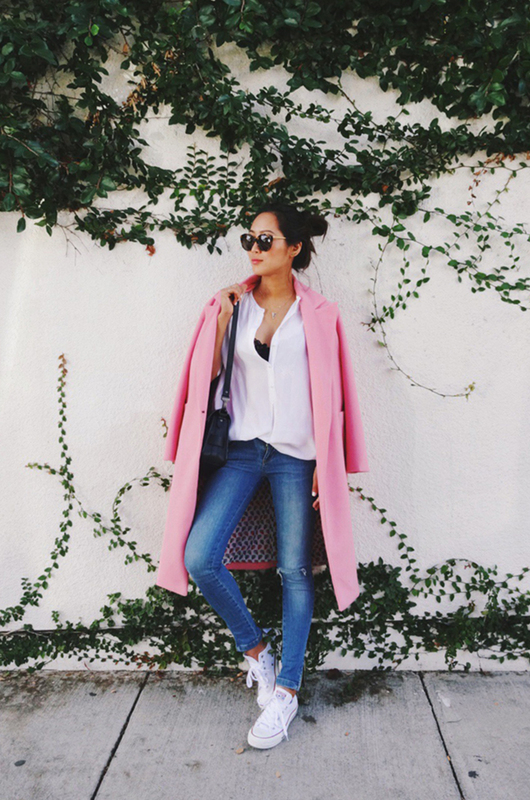 I really, really want a pink coat. I think Im going to get one for London Fashion Week. I think they are great for Spring, and great for cold Summer evenings. Which is your favourite colour coat?